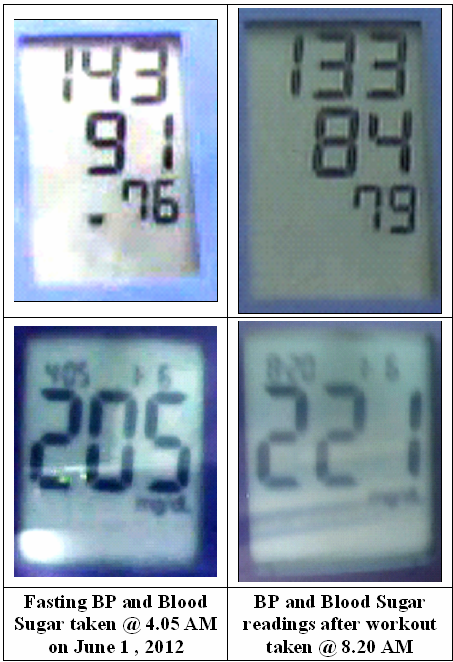 A) The fasting blood sugar was lower than my ‘normal’. Normally, I should have been happy to see this reading but I now know that all these are just readings that have been blown out of proportions. B) Exercise, workout etc. are known to reduce the blood sugar but I observed otherwise. Did the fasting blood sugar come down because I ate at around 7 PM last night and this by the way, was the only meal of the day? This by the way is what the doctors do not recommend as the advice given to diabetics is to eat small frequent meals. I, however, believe that we humans are eating way too much. The body does not need all that once we stop growing. I feel that these are just numbers and do not show the complete facts. 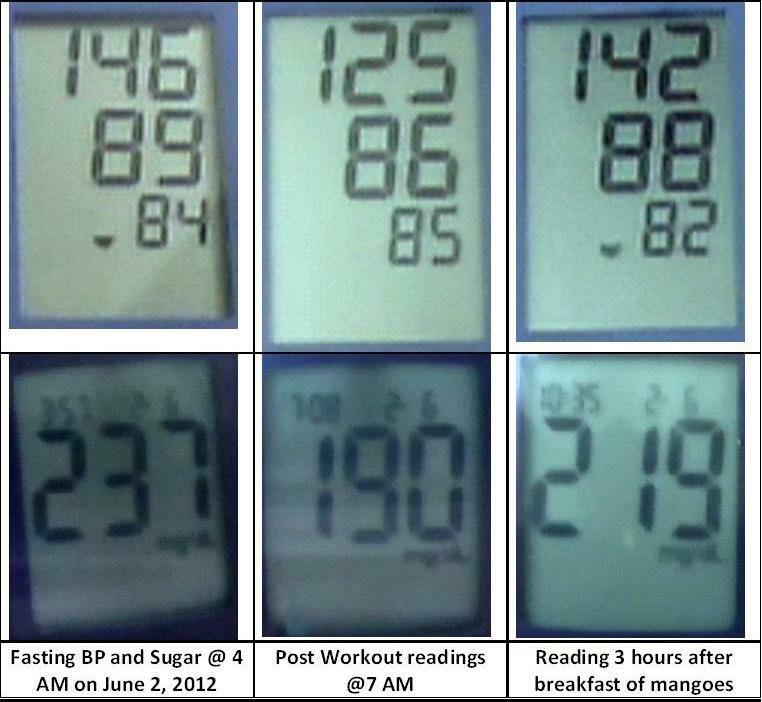 Apparently the breakfast of mangoes pushed up the blood sugar levels but is food the only cause? What about the stresses, if any, that were in my mind during the intervening period? Was I thinking too much about something? How did the news about fuel price hike affect me, if at all? The point I am trying to make here is that the blood sugar and blood pressure are known to fluctuate because of a lot of factors other than what we are eating. Popping pills to control the two, at least to me does not sound like a very wise thing to do but that is what the world seems to be doing. 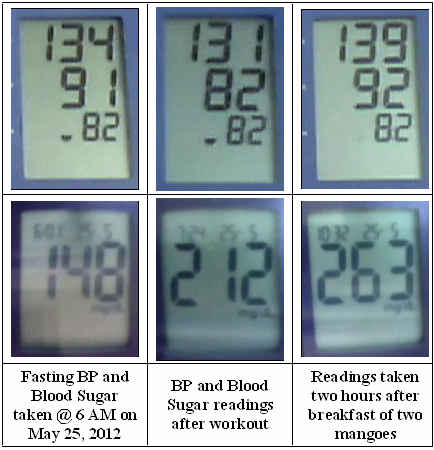 Does Exercise Help Reduce Blood Sugar? I bought a Hero Octane 21 speed bicycle last month. This was a heart decision. I have been taking it out at about 6 am 2-3 times every week for a 20-25 min ride. 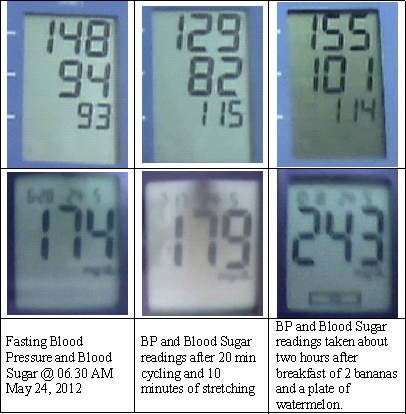 When I woke up today, I was guided to do my sugar tests Before and After going for a ride on my bicycle. Exercise is known to reduce the blood sugar levels. However, in my case the test result did not show that. The following are the three readings taken this morning; at around 6 AM, 7 AM (after the ride) and at around 10.30 AM. I had breakfast at around 8.15 – 8.30 AM which was something that I did not want to have as my body does not need it now. Will do a bit of research over the next few days/weeks and post the results. Today is World Diabetes Day and time to review the progress made over the past year. There have been a lot of changes about this situation which I now know for sure has been misinterpreted and made worse than it actually is. 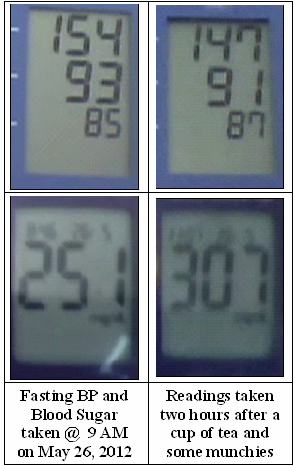 The reading taken today morning showed that my blood sugar level was 155. This does sound a lot better than the 247 exactly a year ago. While for me this is just another figure that now does not bother me at all; I am sure that family and friends who care will feel a bit relieved at this state of affairs. Their worrying is justified as they do not really know what is happening and there is also the fact that I am not taking any medications to control the blood sugar. 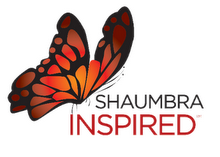 The insights gained during the months of June to August undoubtedly helped clear whatever lingering doubts that I did have. The wee bit of stress that was there is gone now. The body is lighter and after showing the lower weight of about 92 kgs recorded at Ratanveer is now back to a steady 95 kgs which used to be 97 before I had checked in to the nature cure camp. This reduction is happening in a natural manner at a gentle pace. I am not doing any kind of workouts to get rid of the excess weight. I am also not on any special diet plan. I do not eat as much as I used to as Dinner is the only meal most weekdays but I am definitely not watching what I eat or drink. I am just following what my heart – and not my doctor – is telling me. I am not avoiding any sweets and definitely am not eating the recommended small-frequent meals. The fact that my body has now more or less got used to one-meal (dinner) a day lifestyle is personally very gratifying. The only exceptions are Sundays when I do take a bit of breakfast and lunch but then I do need a long nap after that. Invariably dinner on Sundays is very light, most often Khicchdi with a couple of spoons of pure ghee. It’s not that I starve myself; on the contrary, I have forced myself to eat lunch on certain occasions just to see what happens. 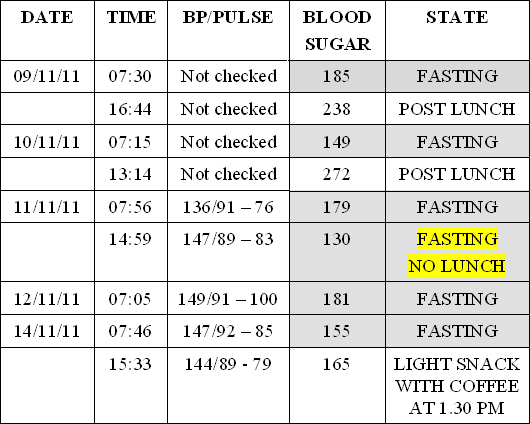 I have ended up feeling miserable a couple of hours after that and this also pushes up the blood sugar as is indicated in the following table for the tests conducted over the last few days. In short, I am doing what the doctor has not ordered and am happier because of that. I am currently going through this process of deep detoxification in the form of frequent coughing attacks, some of which are rather loud and violent. The current phase started around the end of September 2011 and was triggered when I started doing healing sessions for an asthmatic patient who was admitted in a hospital here. (I will be sharing this healing experience in the other space). The fact that the cough and a bit of cold has continued for so long (more than six weeks now) is rather nice because I understand what is happening in the system; otherwise it would have been very alarming and a cause for concern. I know that this throwing out of muck through the cough and cold is my body’s natural way of detoxification. My mind has accepted this totally and therefore I have not had even a single thought that this should end immediately, a though that generally crosses our mind the moment we have a bit of cough and cold. Nature conspires to fulfill the human desires even than as all colds and coughs generally end within about a week’s time. My belief system is the exact opposite and therefore nature is helping me now by letting the detox happen as long as I allow it to. I am just letting it run its full course. The only ‘discomforting’ fact about this phase of detoxification happened during the initial couple of days when the coughing attacks started interfering with my sleep. Almost miraculously, these changed to day-time-attacks the moment I had this bit of insight. Universe sure conspires to fulfill our desires. My sleep has not been disturbed ever since. Wow! I have also observed that I did have a bit of throat pain during the initial days and drinking warm water helped. But since then, cold water, ice-creams etc. have not made the cough and cold any worse. I have also had a bit of releases/discharges from the nose and the ears; so the complete Ear-Nose-Throat system is getting cleansed. The symptoms have tapered off now. BTW, I did go to an ENT specialist as I was having a funny kind of pressure in my ears. I thought that this was maybe due to some extra wax which she could remove from my ears. She did not notice anything wrong in the ears other than a bit of fluid accumulation behind my ears drums. She also looked at my throat which had a bit of inflammation but no infection as far as she could see. To the world, especially when I am having my coughing attacks, it does look like having a bad throat infection. The ENT specialist also wrote down some medication – which of course, I have not taken. So all is well on this day, Nov 14, 2011.